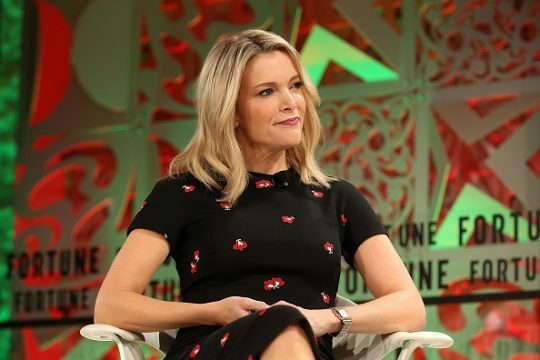 NBC morning show host Megyn Kelly is facing a fierce backlash and potentially the end of her career at 30 Rock over remarks she made defending "blackface" in Halloween costumes. NBC aired an Aug. 31 episode of "Megyn Kelly Today" in lieu of her regularly scheduled live show Thursday and said she will not be on the air Friday. "Given the circumstances, Megyn Kelly Today will be on tape the rest of the week," an NBC News spokesperson told the Free Beacon. She also fired her talent agency CAA, citing conflicts of interest, and signed with UTA before being dropped almost immediately by that firm as well, according to reports. Kelly has hired attorney Bryan Freedman and network sources said negotiations about the end of her show are underway, CNN reported, and cast members and showrunners from the Netflix drama "House of Cards" canceled a scheduled appearance. Kelly, a former Fox News star, got into hot water Tuesday on her talk show program when she stood up for reality TV star Luann de Lesseps darkening her skin to look like Diana Ross. Who doesn’t love Diana Ross? She wants to look like Diana Ross for one day? I don’t know how that got racist on Halloween," she said. "You do get in trouble if a white person puts on blackface at Halloween or a black person puts on whiteface at Halloween… like when I was a kid that was OK if you were dressing up as, like, a character," she added. The comments sparked an uproar at 30 Rock, leading to on-air condemnations on "Today" from African American colleagues Al Roker and Craig Melvin—Melvin called the comments "ignorant," "racist" and "stupid"—and NBC News chief Andy Lack blasted Kelly at a news division town hall on Wednesday. "There is no other way to put this: I condemn those remarks; there is no place on our air or in this workplace for them," Lack said, according to Deadline. NBC News reporter Jacob Soboroff, who was on the panel when Kelly made her comments, called the remarks "vile" on Twitter and said he was sorry for not speaking up at the table. Morning. Want you guys to know how I feel about yesterday. What was said was vile. Not only has blackface always been and will always be racist — questioning that was disgraceful. I’m ashamed I didn’t speak up more emphatically at the table. I’m sorry if I let you down. Kelly emailed an apology to her staff and then gave a tearful on-air apology Wednesday for the comments, saying she knew now they were racially insensitive. "You may have heard that yesterday we had a discussion here about political correctness and Halloween costumes," she said. "And that conversation turned to whether it is ever OK for a person of one race to dress up as another, a black person making their face lighter or a white person making theirs darker, to make a costume complete. I defended the idea saying as long as it was respectful and part of a Halloween costume, it seemed OK. Well, I was wrong and I am sorry." Kelly said she had never been a "PC" person but realized she had made a mistake, and she received a standing ovation from the studio audience. Kelly, who is midway through a three-year contract, did not respond to a request for comment. A source close to her told The Daily Beast that Lack took advantage of the blackface gaffe to punish her. "This was Andy taking revenge on Megyn," the source said. "It was payback." A former NBC staffer who worked with Kelly told The Daily Beast that NBC is angry that Kelly called for an independent investigation into the network’s handling of Ronan Farrow’s reporting on Harvey Weinstein, which never aired. "They are trying to use this as a platform to restore their credibility," the staffer said. "They have never before come out as strongly as this. "For them to have had it on Nightly and the TODAY show, it would have been discussed by Andy and Noah. She was going very hard on the #MeToo stuff and they didn’t like that, and they couldn’t stop her, and now this is payback." Since being lured from Fox News Channel with a reported $23 million annual contract, Kelly has struggled to find a niche at NBC News. She struggled in the ratings with her Sunday night newsmagazine, and the launch of her morning show got off to a rocky start in the ratings and in awkward moments. She shocked her NBC colleagues with her blistering remarks about Jane Fonda's infamous conduct during the Vietnam War, following Fonda's repeated jabs at Kelly for questions about the famed liberal actress' use of plastic surgery. NBC News did not respond to a question about whether she would still be a part of the network's midterm election coverage next month. She recently appeared on NBC's special coverage of the Sept. 27 testimony of Christine Blasey Ford and Supreme Court Justice Brett Kavanaugh after the former accused the then-nominee of sexual assault when they were teenagers. This entry was posted in Politics and tagged Megyn Kelly, NBC, NBC News. Bookmark the permalink.